- A persons point of view is naturally subjective to get a fair view of the bigger picture is intellectually challenging. - We have to rely on other people for the knowledge and information we have. - Limited facts are available. - Human knowledge and information storage capacity are limited. - We are naturally biased, due to our own biographies and life experiences. - There is systematic promotion of certain narratives by lobby groups, while certain facts are ignored or even suppressed. - Most historians and academic researchers are bound into a power structure. They may deny it, but it's clear can't say or do what they want. If they deviate from a paradigm, it will have repercussions for them. Of course there is still a difference between someone that uses make-up-as-you-go arguments and someone that really tries to find all available facts, studies them and tries to recreate a fair picture of past events. But it's also a difference in degree. That's why it's important to have a number of Points of View available. Henry Herskovitz is a member of Jews for Justice for Germans (JFJFG), an group whose aims and objectives include calling on Elie Weisel to apologize for his statement calling on Jews to “set apart a zone of hate -- healthy virile hate” for Germans, to open the discussion of the history of “interactions between Germans and Jews 1933-1945” and to repeal all Holocaust denial laws, to end German reparation payments to Israel and Jewish survivors of Holocaust, to discuss the possible repayment of reparations back to Germany, and to “ begin discussions about the role of Jews in the suffering inflicted on Germans since 1945 and, if appropriate, to make arrangements for apology, reparation and compensation." Henry Herskovitz is an outspoken anti-Zionist and historical revisionist,. Henry Herskovitz shares the views of Ernst Zundel, a German publisher known for promoting Holocaust revisionism and author of the "Hitler we Loved and Why" who was jailed for "spreading false news" but the conviction was later overturned by the Supreme Court of Canada when the law criminalizing reporting false news was ruled unconstitutional. 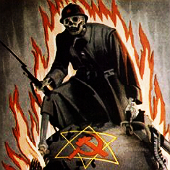 Following his visit, Henry Herskovitz wrote, "Ernst Zundel, the reputed anti-Semitic devil, did not merely shake hands with me; he held mine in his. Eight years later the memory remains strong." On his blog, Henry Herskovitz published a test to distinguish “a peace and justice activist” from a “Zionist pretender”. I came across a website which is believe it or not called "Jews for Hitler". At first I thought it was a parody like something out of the pages of Mad Magazine but apparently they are genuine. They have a documentary called The Holocaust - Shifting the Blame. At least as early as 1994 Robert Faurisson foresaw the possibility of Jewry taking credit for discovering the fraudulence of the holocaust. I'm a bit leery of some, and maybe all, Jews who dabble in holocaust revisionism. I'm skeptical of the view that when the world finds out the holocaust is a fraud that this will spell doom for Jewish hegemony. I think that the co-religionists of Mr. Berenbaum will at last abandon the gas chamber as they have abandoned the Jewish soap and the Auschwitz 4 million. They will go farther than that. As in the two previous cases, they will present themselves as the discoverers of the myth and accuse the Germans, the Poles, or the Communists of having fabricated the ‘myth of the gas chambers’. In support of their impudent thesis, they will then invoke the names of Jews who are Revisionists totally or in part (J.G. Burg, Jean-Gabriel Cohn-Bendit, Roger-Guy Dommergue, Arno Mayer, David Cole, Christopher Hitchens, Joel Hayward ?). They will then assign themselves the starring role. hostile to the free expression of religious sentiments. For those Jews, the true Revisionists will thus continue to be diabolical in spirit even if they must be acknowledged to be in the right from a factual point of view. Ron Unz has written a lengthy and detailed article on why he thinks holocaust revisionism is worth investigating. The comments section is also very encouraging. Ron Unz deserves our full support. Is it just me, or does that persons voice sound a bit like Erik Hunt? Mortimer wrote: I came across a website which is believe it or not called "Jews for Hitler". At first I thought it was a parody like something out of the pages of Mad Magazine but apparently they are genuine. They have a documentary called The Holocaust - Shifting the Blame. Mortimer wrote: Ron Unz has written a lengthy and detailed article on why he thinks holocaust revisionism is worth investigating. The comments section is also very encouraging. Ron Unz deserves our full support. Ron Unz is the man of the year. There was a second article in October on what I call the hollow hoax where there's no doubt in his mind that the story is either partially or totally false. His very public "awakening" to the jewish question began last June with "The Remarkable Historiography of David Irving" portraying the historian very favorably. He's written or hosted articles discussing Israeli involvement in the 9/11 attacks, which is another big shibboleth. "Oddities of the Jewish Religion" was about how he grew up in a family where Yiddish was spoken and is such a smart guy and all but he has only recently learned about things that Israel Shahak, Elizabeth Dilling, Rev. Ted Pike, David Duke, Michael Hoffman, Gerard Menuhin, et al. have written about Jewish supremacism and its disdain for goyim. His "Has the ADL Gone Into Hiding?" was about him getting just a peep of protest from the ADL and Unz was publicly asking the ADL why they hadn't attacked him with vigor as he had expected. Just a few days ago he had http://www.unz.com/ldinh/heart-of-darkness-germany/ where it's apparently taken for granted that the Holocaust is a hoax. The tide is turning. Many people are being woke to the fact that what "everyone" believes is either illusion or delusion. Re the tide turning, at youtube the state department had a page about Mike Pence's recent visit to Aushwitz and the public comments had a goodly numbeer, maybe as much as 1 of 3 expressing skepticism and even some disdain about the ostensible function of that work camp, with those commenters risking the loss of their account. Dr Alan Sabrosky is a 9/11 "truther" who has claimed Israel is responsible for the attacks. He earned a Masters degree in History and a doctorate in Political Science from the University of Michigan. This is not an endorsement of PsyOps expert Pieczenik, but rather just highlighting an interesting developing. If a European was to say exactly what Steve says here, he or she could be imprisoned for many years. He should let his audience know about Hellstorm, which details the incredible suffering of the German people during and after WW2. "They (Israelis) created an industry that developed the holocaust.... Manufactured by the Israelis, so that the United States could support Israel to the tune of 80 to 100 billion dollars to date".